But it is still a lovely, peaceful village. I've written a few posts lately about this area of East Crete, so I'm not going to wax lyrical about the changing colours of the mountains as the sun sets, or the amazing contrast of bright blue sea and the silver-green of the endless olive groves... well, maybe I will, a little. 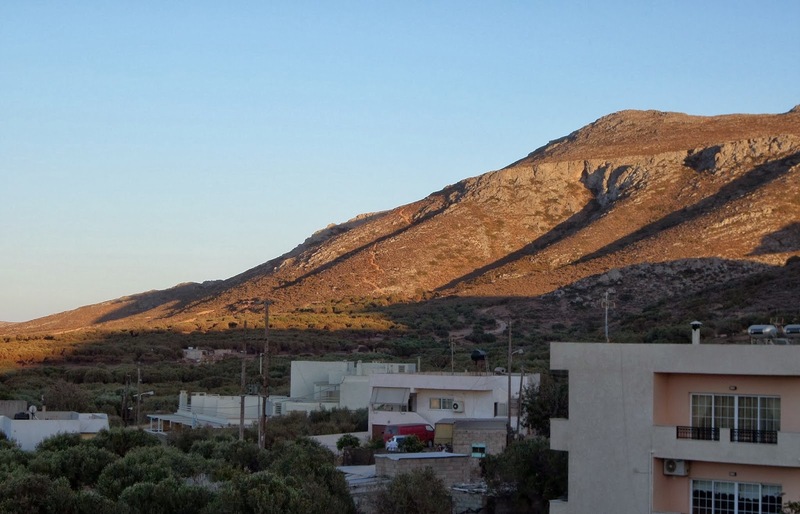 I love this village for its natural surroundings, but architecturally it's not the prettiest of the Cretan villages. Of the traditional style of architecture, there are a few smaller, single storey houses, one or two crumbling mud brick walls and a small and pretty church. However, there are a couple of good tavernas and raki 'bars', with great views, which have welcomed us with our dogs on several occasions. 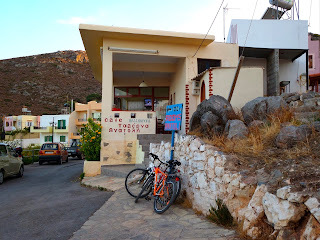 The Cafe-Taverna Anatoli is a great, cheap option, serving the Cretan spirit raki with mezedes, and a limited but reasonable selection of meals. 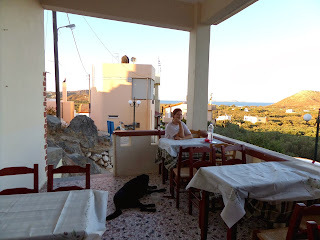 This summer we paid just 4€ there for a half litre carafe of wine and a small meze (cheese, olives, tomatoes, cold meats). I just said I wasn't going to write too much about the views and the surroundings, but I have to. It's the best thing about the Anatoli. 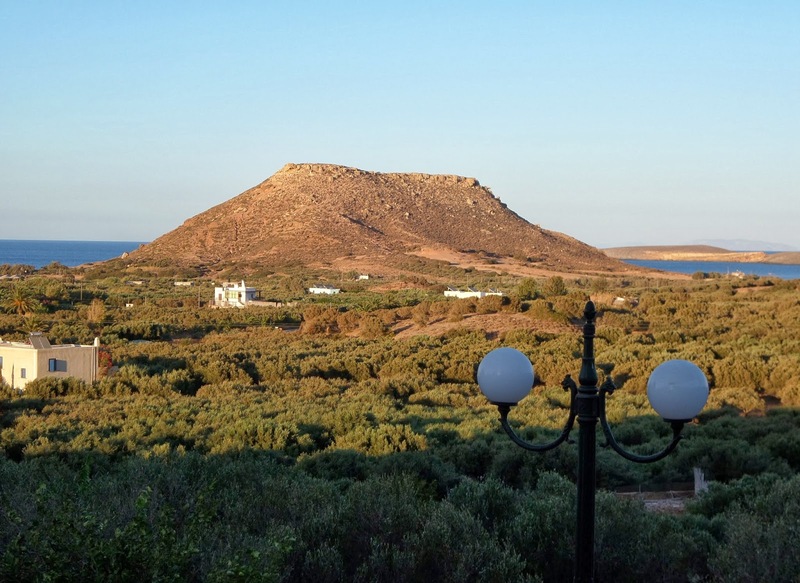 From the terrace at the front, you have a truly wonderful view - out over a sea of olive trees, down to the distinctive Kastri mountain at Xiona Beach, and in the other direction, up to Mount Petsofas and the mountains that separate Agathia from Zakros to the south. The owners were very friendly and welcoming when we asked whether we could bring Sage in too, and the other customers spent some time petting her and asking all about her. The Anatoli is open throughout the year, but if you are there in winter it may be a good idea to let them know in advance if you are planning to eat there. Moving on, another taverna in Agathia that welcomed us with Sage (my friends also took Garby there), was the Meltemi. 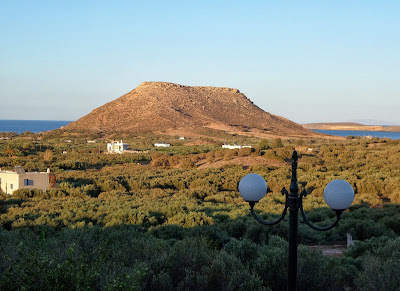 This taverna does not have the wonderful views that the Anatoli does, but the food there is great. 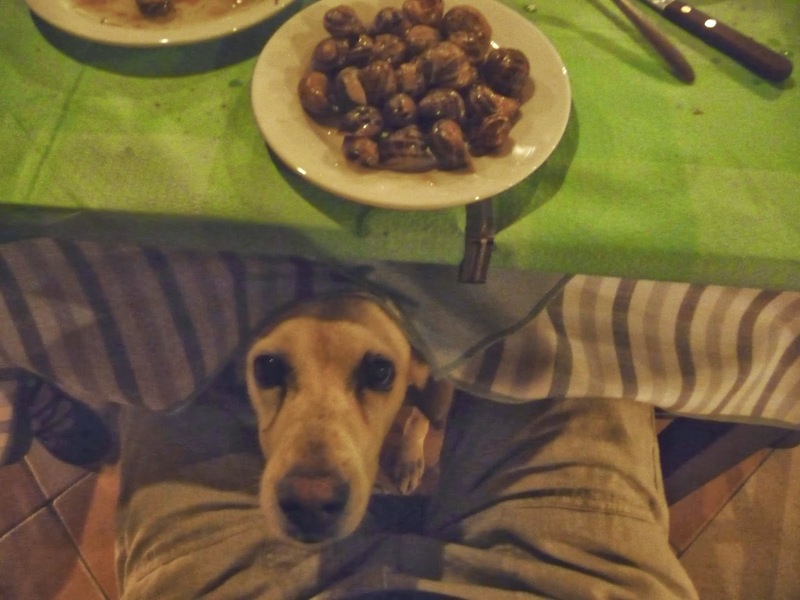 I have to say, even though I'm not a fan myself, that their speciality is the traditional Cretan dish - snails. The Meltemi serves a good variety of food, also fairly reasonably priced. We each paid about 10€ for a dinner of many small plates - salads, chips, meat, cheeses, and quite a lot of wine. 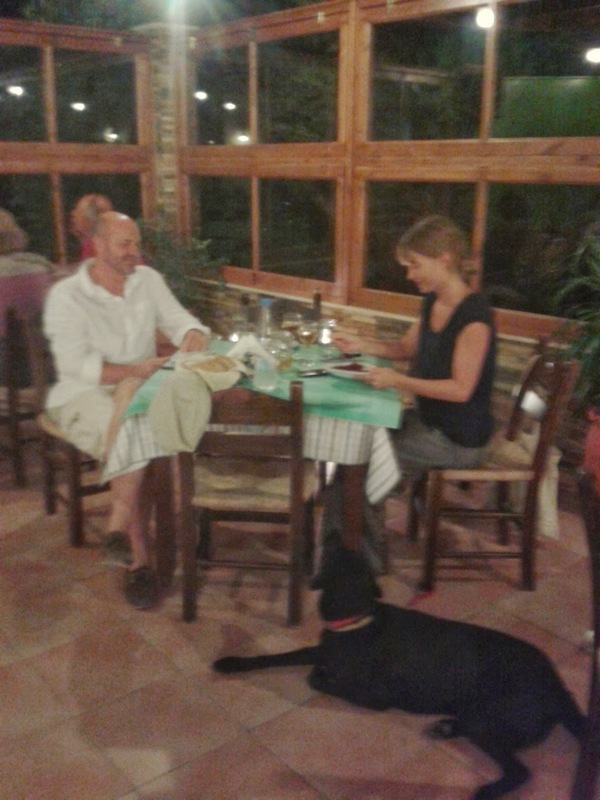 Staff at the Meltemi were fine about us bringing Sage to dinner with us, under the covered terrace of the taverna. They told me that they were also open during the winter, and that I could bring Sage inside the taverna, providing that she was well behaved, and we sat out of the way of the other customers. 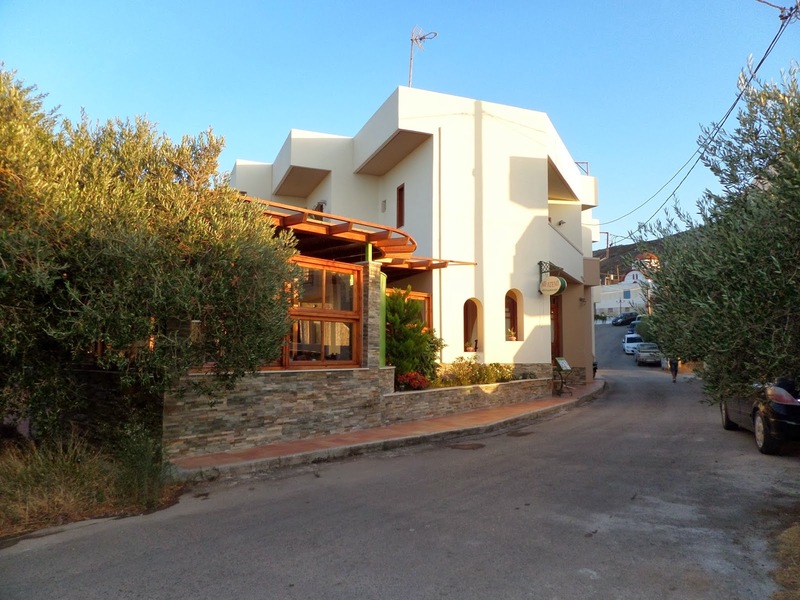 These rent rooms, near the entrance to the village from the road from Palaikastro, are quite spacious, very clean, have private bathroom, fridge and tv, and, most importantly, have balconies with views down to Kastri and beyond to Kouremenos Beach. It's lovely to wake up and have coffee on the balcony, and watch the windsurfers out in the bay. A final note, this village is a great base if you want to explore the east end of the island. 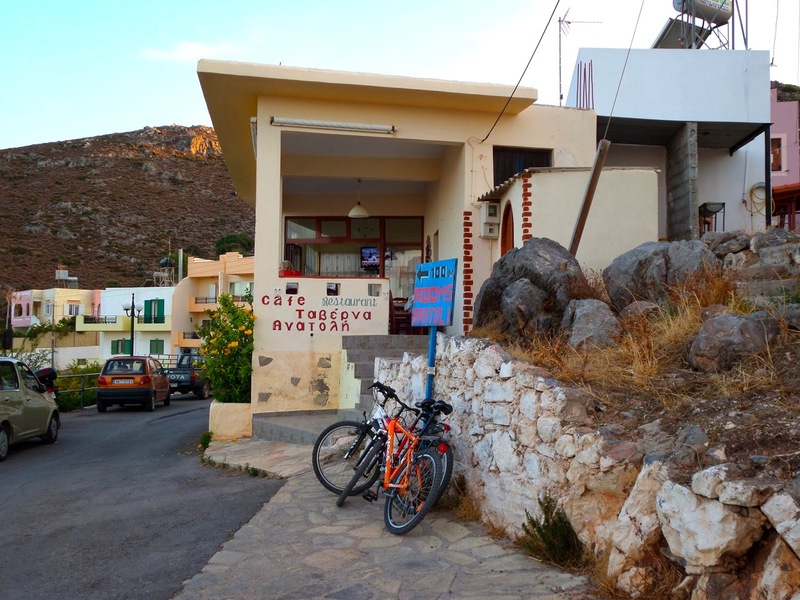 From here you can get to Zakros in less than half an hour, to the palm beach at Vai, to Toplou Monastery and Siteia, not to mention the numerous beautiful and deserted beaches all along this part of the coast.